After four consecutive days in a different hotel every night, we slowed the pace a bit and signed up for two days at the Hali Country Hotel, just up the road from the famous Jokulsarlon glacial lagoon and the black sand “Ice Beach.” Our guide, Haukur, had also arranged for an early morning visit to a puffin colony at Cape Ingolfshofdi. 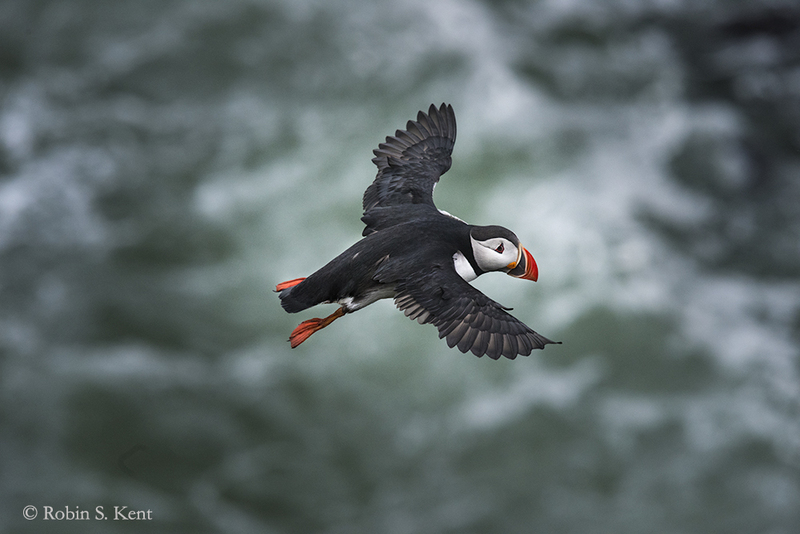 Puffins spend most of their lives living in the open ocean but in the spring many of them flock to coastal colonies in Iceland. But it takes some effort to get close to them as the image above suggests. There was no road and no visible trail to the base of the promontory where the puffin colony was located. The several kilometers of splashing through marshes and undulating fields of soft lava ash makes one imagine they are testing a prototype for a new carnival thrill ride. Then comes the hard part, trudging with a pack of camera gear up a steep slope of lava ash and sand, something akin to climbing a sand dune. But at the top, one finds a field of lush green grass which stretches out invitingly….to a sudden drop off a vertical cliff high above the ocean. The puffins nest in burrows they have found or excavated themselves, bringing in grass and feathers as lining for the chicks. 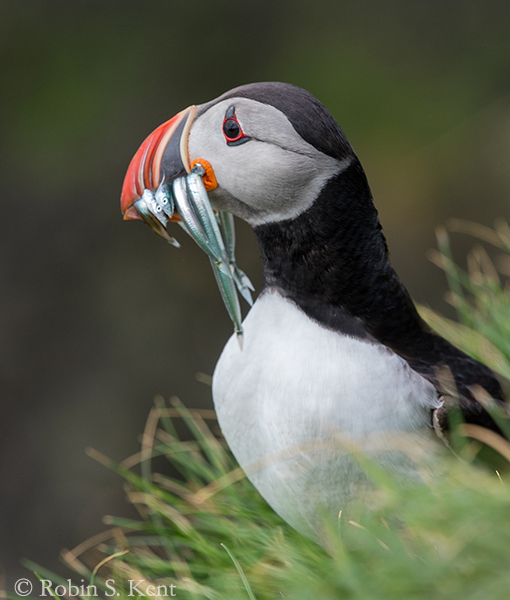 The puffin’s diet consists almost entirely of fish, which it captures by swimming under water using its semi-extended wings as paddles and its feet as a rudder. We couldn’t stay too long in any one spot because the puffins would wait until we were a safe distance before entering their nests and feeding their young. 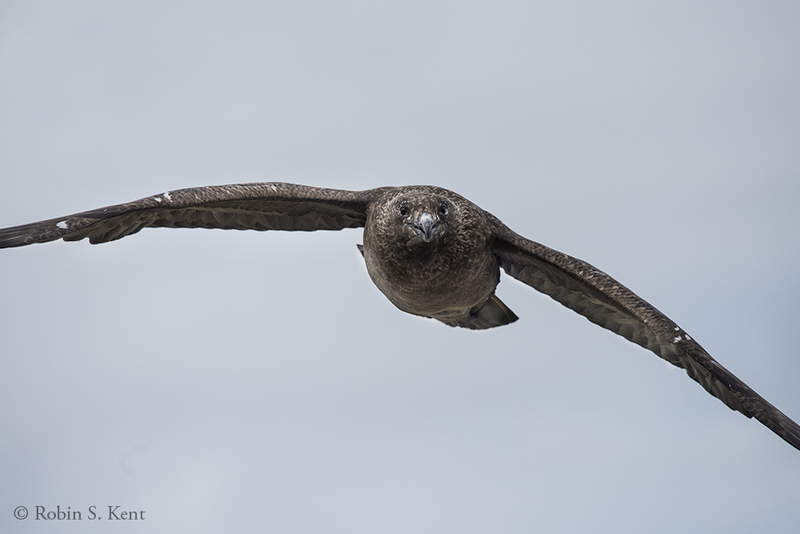 As cute as the puffins are, their neighborhood has a bad element…a large thug of a bird known as the great skua. The skuas build their nests on the ground out in the open, almost as bait for naïve trespassers whom they attack with with fiendish glee . When a bird this large (4-foot wing span) is heading directly at your face……. 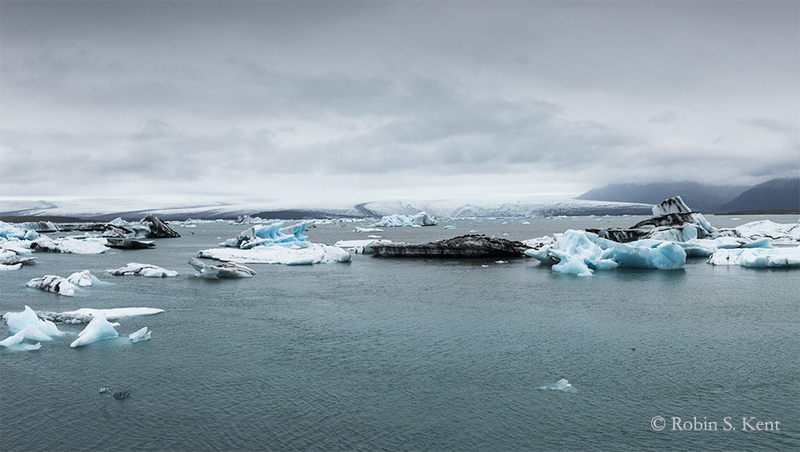 The Jokulsarlon glacial lagoon is not far from Cape Ingolfshofdi and is a favorite stop for most visitors because of its dramatic scenery, easy access, and its full range of services (café, souvenirs, boat rides, etc.) Icebergs breaking off the Vatnajökull glacier float in the lagoon eventually working their way out a narrow channel into the ocean. 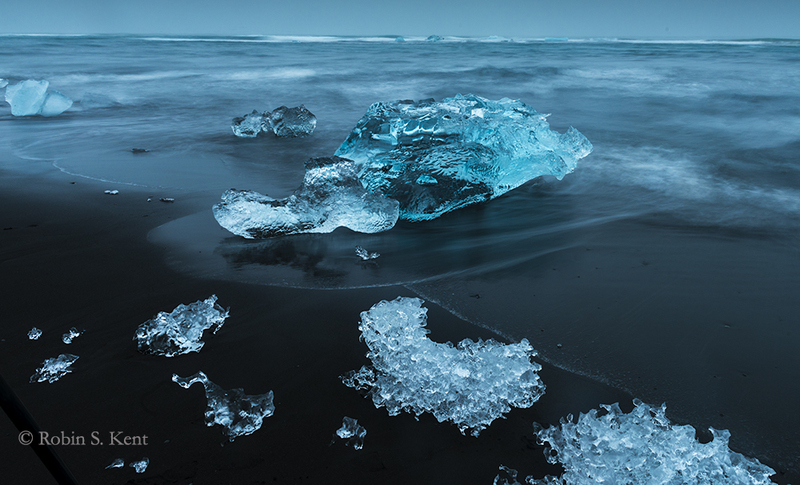 Once in the ocean, many will be pushed up by the tide onto a black sand beach, the famous Ice Beach, providing numerous opportunities for photographers. At the back of the parking lot away from the tourists, a flock of Arctic Terns had taken possession of a field for a nesting colony. 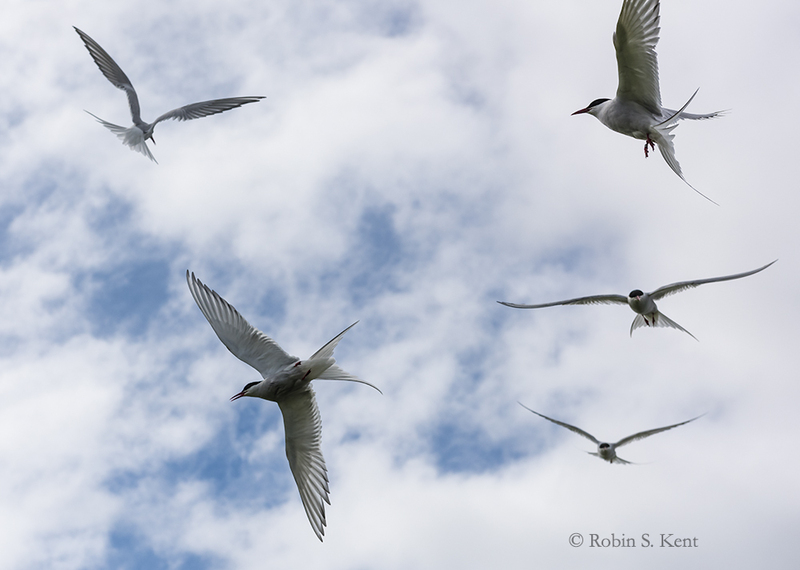 The tern is famous for its incredibly long migration route, the longest-distance migration of any bird, moving between its Arctic breeding grounds in Iceland and Greenland and its non-breeding territory in the Antarctic, a distance that approaches 25,000 miles. And they share one characteristic with the skua: the ferocity of their attacks on trespassers. Although they are much smaller, they use a team approach, overwhelming the target with their numbers. There is a second glacial lagoon, Fjallsarlon, just a few miles down the road from the far more popular Jokulsarlon. The lagoon is smaller than Jokulsarlon; there are no tourist services and the water is not as blue. But the solitude was a nice contrast. 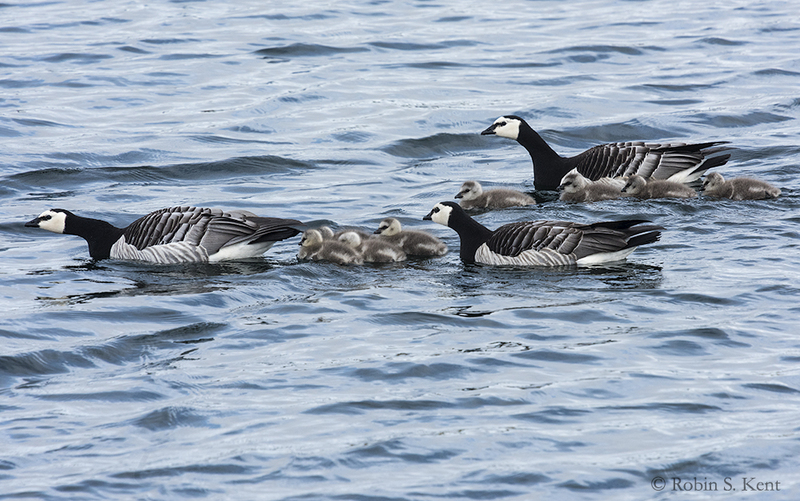 When it was time to leave, Haukur suggested a short hike to some nearby ponds where we might find some geese. 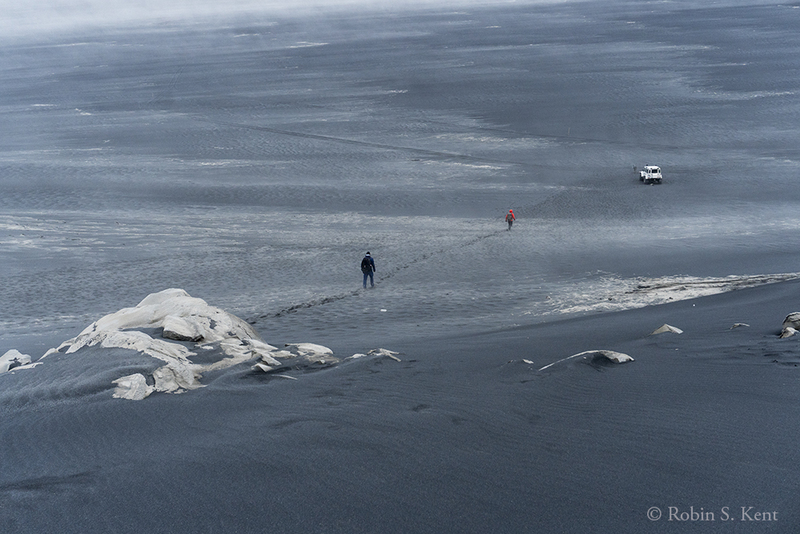 One of the most magical experiences on any Iceland tour is a visit to the Ice Beach. It is here that the last remnants of a dying glacier wash up on a black sand beach and complete their thousand-year life cycle. These stranded crystal sculptures seemed almost alive as the surf swirls around them, refracting and reflecting the dim light of the late evening.